Pause before God, be in His Word. Worship with us to prepare for our coming King! Family Advent Celebration- Bring the whole family out for a morning designed to prepare our hearts for Jesus' coming. Build an advent wreath to help focus your family's devotions. Sing favorite Christmas songs. Hear the Christmas story. Work together to create a gingerbread house. TLW Christmas Supper- Ladies you don't want to miss this event! For $15 you share a terrific meal while enjoying wonderful company. If you want to participate in the gift game bring a $20 gift. Supper begins at 6:30 p.m. Sign up on the sheet at the Welcome Table. Ministerial Barn Service- Enjoy a rustic evening of carols and hearing the Christmas story in a barn! Held at Dan Trautwein's farm (1 mile North of town). Sunday School Program- The kids will be excited to share the Good News of Jesus coming to earth with us during the worship service! Christmas Cantata- A favourite event each year which brings talented singers from the whole region together. 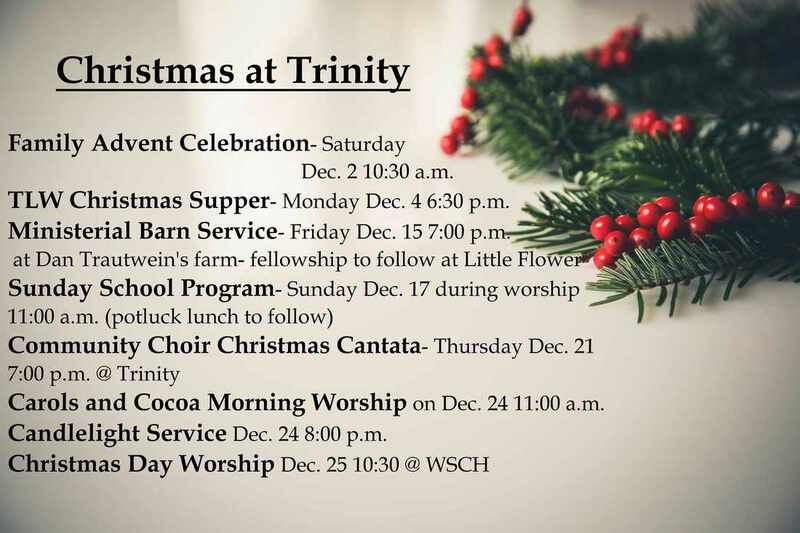 The Leader Cantata will be held at Trinity this year. Carols and Cocoa Morning Worship- Dec. 24 morning is the 4th Sunday of Advent. Enjoy a quiet morning of carols, fellowship, cocoa, and hearing God's Word. Candlelight Service- The tradition continues! Join us for a awe-inspiring time of worship as we celebrate the birth of Jesus! Christmas Day Service- Once again we will be with our seniors at WSCH for our morning service. This is a quieter service but one filled with joy and excitement.